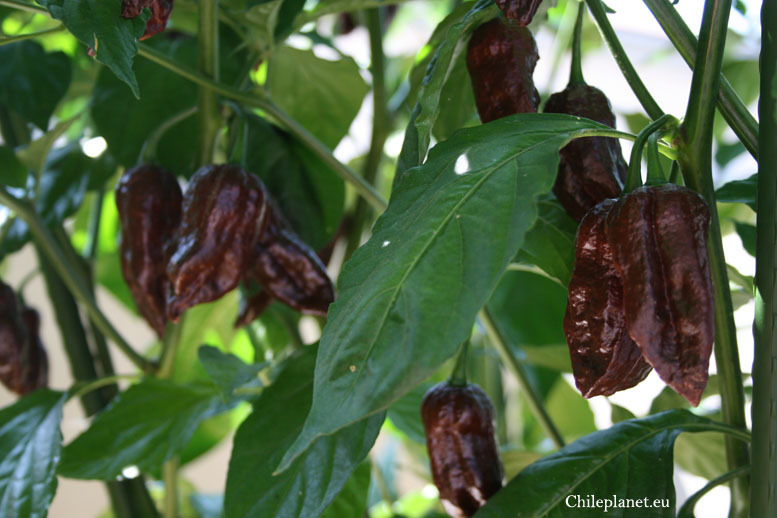 Bhut Jolokia Chocolate: C. chinense. Ibrido tra Capsicum chinense e Capsicum frutescens. Varietà dall'India, resa disponibile al pubblico nel 2008 grazie alla Frontal Agritech. Variante naturale del Bhut Jolokia. La pianta è robusta, abbastanza produttiva e può crescere oltre il metro. I frutti hanno un aspetto un pò rugoso. Ha tutte le caratteristiche del Bhut Jolokia rosso ma è molto più dolce e fruttato. 800.000 - 1.001.300 SHU. Hybrid between Capsicum chinense and Capsicum frutescens. Variety from India, made available to the public in 2008 thanks to the Frontal Agritech. Natural variant of Bhut Jolokia. 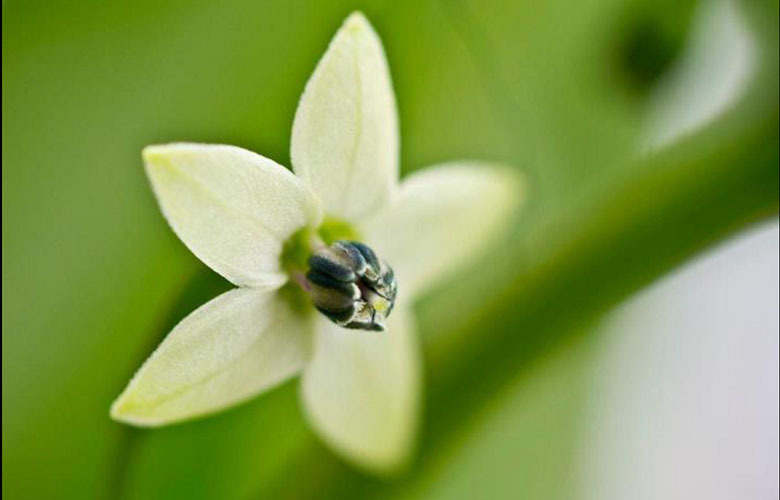 The plant is sturdy, productive enough and can grow over a meter. The fruits look a bit rough. It has all the characteristics of the red Bhut Jolokia but is much more sweet and fruity. 800.000 to 1.001.300 SHU. Híbrido entre Capsicum chinense y Capsicum frutescens. Variedad de la India, pondrá a disposición del público en 2008 gracias a la Frontal Agritech. 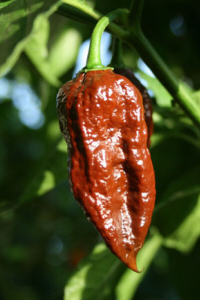 Variante natural de Bhut Jolokia. La planta es lo suficientemente robusto, productivo y puede crecer más de un metro. Los frutos se parecen un poco áspero. 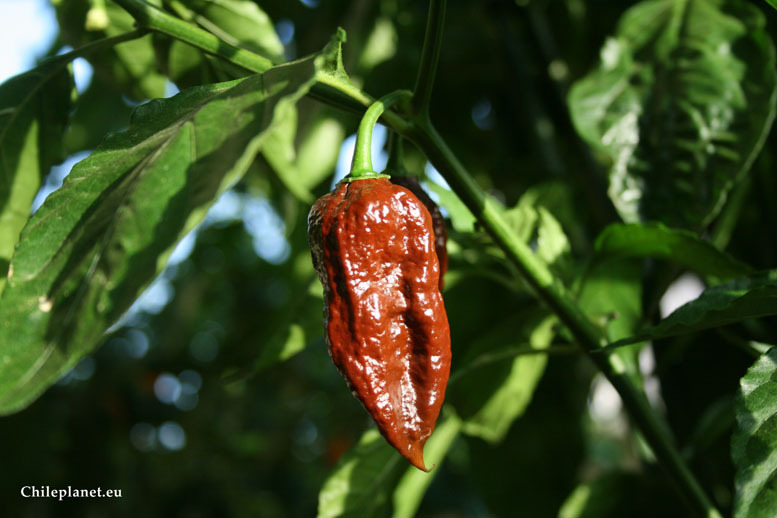 Tiene todas las características de la red Bhut Jolokia, pero es mucho más dulce y afrutado. 800.000 a 1.001.300 SHU. Hybrid zwischen Capsicum chinense und Capsicum frutescens. Variety aus Indien, aus der Öffentlichkeit zur Verfügung im Jahr 2008 dank der Frontal Agritech. Natürliche Variante Bhut Jolokia. Die Pflanze ist robust, produktiv genug und kann über einen Meter wachsen. Die Früchte sehen ein bisschen rau. Es hat all die Eigenschaften des roten Bhut Jolokia, ist aber viel mehr süß und fruchtig. 800.000 bis 1.001.300 SHU.